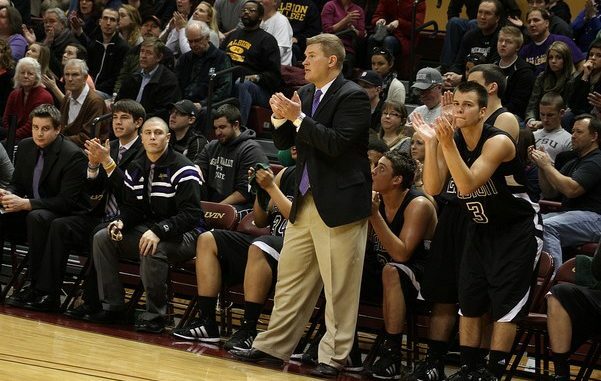 The Albion College men’s basketball team kicks off their 2013-2014 season today against Eastern Michigan University. The Britons, who are coming off a disappointing season, are focused on changing the team mentality. After the men’s basketball team finished 6-19, conference record, last year, they have taken the time to discuss team goals in terms of what needs to change on and off the court. “We’re trying to get the program back into the right direction, win the league title and we need to defend our home court,” said Zach Hurth, Lansing junior. The men’s team improved team chemistry over the offseason. Players have been pushing each other in practice to exceed their limit. Conditioning and weight training were focuses for the Brits. “We got to the point of when we pushed guys, there was this mentality of getting it done or don’t play on the team,” Elliot said. The Britons have also but an emphasis on off the court bonding. The men’s team implemented team dinners the night before games and hanging out with each other as much as possible. “I really like our guys chemistry this year and it’s been a great group to work with, “ said Jody May, Albion men’s basketball coach. Carter Elliot mentioned that the chemistry has been the best in his three years at Albion. Coach May and the rest of the team will look to team captain Zach Hurth, Lansing, MI junior, for leadership this season. As the lone captain on the team, he will play a big role for Albion on and off the court. “We’ve relied on Zach Hurth since the end of last year, with him being a leader and a captain, which he has done a great job with,” May said. Hurth has been training hard to improve his game this offseason. “I’ve been working on getting quicker and doing things like shooting and ball handling to get ready for the season.” Hurth said. Even though Hurth is the only captain on the team, Coach May will be looking for others to step up in leadership roles as well. The men’s team has a very young squad this year, with only five upperclassmen leading the Britons into their 2013-2014 campaign. With the new team mentality, new team goals and improved chemistry the Britons are heading in the right direction. They are going into every game with the mindset that they are going to win.